Independent market research firm, Common Sense Advisory, recognizes Eriksen Translations Inc. as a leader in $40.27 billion global industry. As we celebrate our 30th year in business, it is an honor to once again be recognized by Common Sense Advisory for our role in this thriving industry. Eriksen Translations Inc. (http://www.eriksen.com) announced today its official ranking as one of the largest language services providers (LSPs) in the translation and interpreting industry. Issued in July 2016 by independent market research firm Common Sense Advisory (CSA Research), the report titled "The Language Services Market: 2016" ranked Eriksen as a top-grossing language service provider in the $40.27 billion global market for outsourced language services and technology. 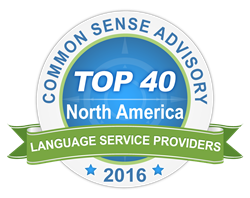 Eriksen maintains its ranking as one of the top 40 language services providers in all of North America. For 30 years, Eriksen Translations has been helping companies communicate with their audiences in the diverse domestic and global marketplace. By combining high quality standards with cutting-edge technology, Eriksen has developed longstanding relationships with major companies in finance, insurance, law, health care, and education, as well as nonprofits and leading museums and cultural institutions worldwide. Eriksen works in more than 100 languages, providing translation, layout and production, and cultural consulting, as well as multimedia solutions including website localization, voice-overs, and subtitling. CSA Research, which has published market size estimates and global rankings for the past 11 years, found that the demand for language services continues, and is growing at an annual rate of 5.52%. As part of the study, the firm surveyed language services providers to collect actual reported revenue for 2014, 2015, and expected revenue for 2016. As organizations both large and small address more languages, CSA Research predicts that the language services industry will continue to grow and that the market will increase to $45 billion by 2020. The full report, including all regional rankings, is available as part of the firm’s research membership. Founded in 1986, Eriksen provides multilingual services in over 100 languages, offering translation, layout and production, web and multimedia localization, cultural consulting, and voiceover and subtitling services. Headquartered in Brooklyn, Eriksen partners with companies in finance, insurance, marketing, law, health care, and education, as well as nonprofits and leading museums and cultural institutions worldwide. For more information, visit http://www.eriksen.com.